The Cumberland & Dumfriesshire Farmers Mart P.L.C. 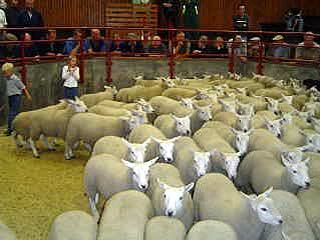 had forward 3,866 head at their weekly sale of store hoggs at Longtown on Tuesday 19th January 2010. A large show and more distant buyers saw trade easily upheld. Top of £87.50 and £84.50 for Suffolks from Candybank; Texel £77.50 Beechcroft, £75.50 Haithwaite, £75.20 Shield Hill; Charollais £75.50 Sleetbeck, £74.50 Lodge House; Beltex £74.50 Haithwaite; North Country Cheviot £74.50 Carpet Farm, £72.80 Kelsocleugh; Lleyn £73.80 Rammerscales; Greyface £71.80 Patties Hill, £70.20 Greyside; Blackface £67.50, £61 Halterburnhead, £63 Balmurrie; Hill Cheviot £66.50 High Thorneyburn; Swaledale £48.20 Newholm, £48 Wydoncleughside; Kendal Rough £46.50 Beechcroft. Ewe lambs to £82.50 for Texels from Newbiggen who also sold Suffolk crosses at £77.50; Greyface £69.50 Beechcroft. In lamb ewes to £74 Candybank. Cast ewes to £94 Candybank, hill types £73.50 Greyside. Cast rams to £144 Candybank, hill types £102.50 High Thorneyburn.